I learned about the Jewish community in Squirrel last year when we began filming our 7th Episode, “Horses for Heroes”. It was a Saturday morning that we filmed our musical performance at Levity Float Spa, and then headed out on the street to see if we would have any luck raising money for Breaking Free Horse Farm. No luck was had. The Jewish religion observes Sabbath on Saturdays, so we were basically walking through a ghost town. We still had a great time and the drone shots of us in front of the mural are some of my favorite images from our series. I think it broke a lot of our hearts. The man, the myth: Pete Peters. Bonus points to Pete for wearing a Giant Panda Sweatshirt. I think any time I wear winter clothes with this beard I look like I should be in the Sticky Bandits. One of the things that I’m proudest about Spare Change is that when we’ve had departures of team members, I’ve been able to salvage friendships. A younger Josh would not be able to do this. I love watching Taylor’s progress as he begins to master the bass guitar. Pete has been my ear to the ground with the inner workings of the Pittsburgh music scene. From time to time, we’ll even link up for a show, as “Josh and Pete” — reviving the spirit of our early performances on the streets of South Side. It was because of this that Pete invited me to perform at the Winslo6 Food Truck Roundup benefiting Tree of Life Synagogue. 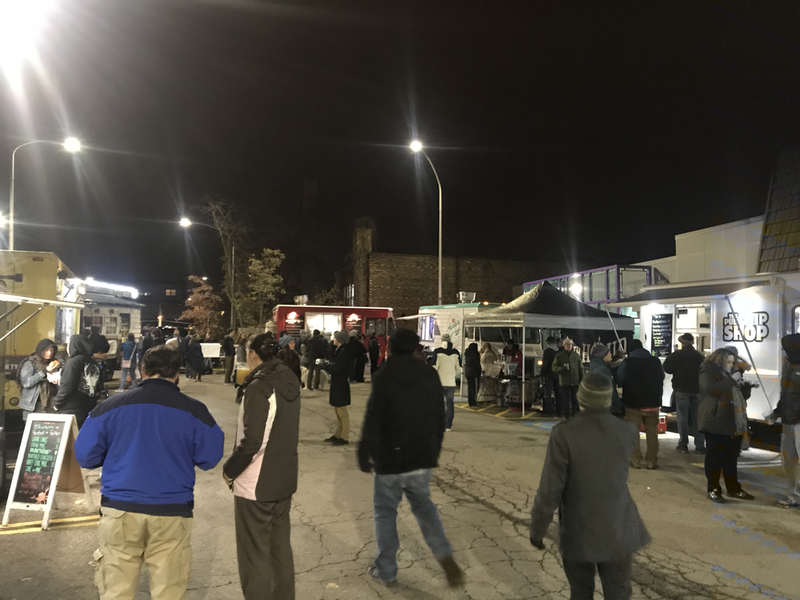 On a cold Tuesday after work, I headed over to Squirrel Hill to join Pete and what seemed like all of Pittsburgh’s Food Truck community to do something that might contribute in some small way in the wake of such devastating events. Although we only played for about 40 minutes, and my hand was frozen for at least half of them, it felt really great to see the community out enjoying each other’s company. There were people as old as grandparents and young as kids. They were as diverse as any community you could imagine. And for a moment, it felt like the old days. Mystery and adventure. A community with a big heart— broken, but hopeful with the promise of repair.